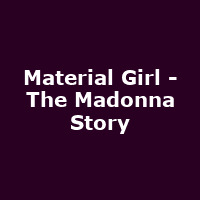 "Material Girl celebrates the greatest songs from the Queen Of Pop, Madonna. With incredible vocals, amazing dancers, video footage and narration, audiences are taken on a journey through the scandals, the controversy and of course the music of one of the world's most iconic figures. Told through the eyes of our leading lady, Jodie Jackson, audiences will hear stories and little-known facts about Madonna as the show follows her career and music through her 35 years at the top. Material Girl features all of the hits such as Like A Virgin, Papa Don't Preach, Vogue, Crazy for You, Into The Groove, Like A Prayer, Express Yourself and many more."